The first day of London Fashion Week fall 2015 brought the debut collection of the new creative director of Sass & Bide, Anthony Cuthbertson, who decided to stay true to the Aussie brand’s aesthetic and illustrate the best of the unique Sass & Bide laidback style spiced up with the right proportion of glamour. 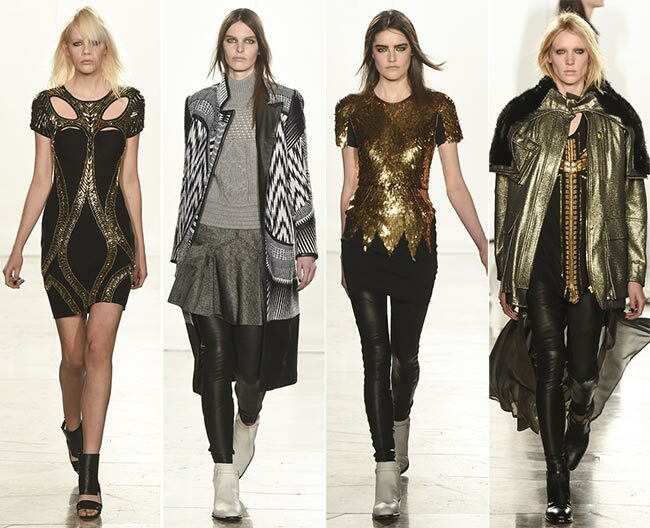 The Sass & Bide fall/winter 2015-2016 collection came all drenched in a glamorous “warrior spirit’ with a big focus on lots of embellishments, knitwear, chic outerwear and luxurious fabrics. Best of all, he managed to combine this gladiatrix mood with relaxed silhouettes for a subtle casual feel that made each and every look showcased so much more functional and wearable. 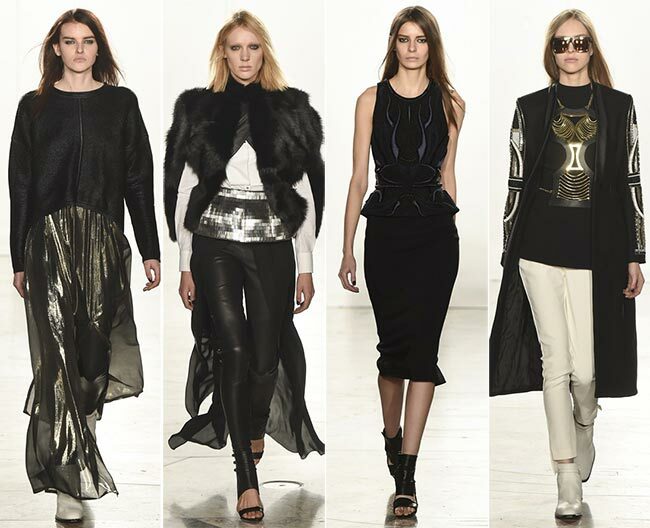 From the aspect of the color palette used, the entire collection seemed to be quite reserved, using big proportions of black embellished with lots of glittering metallic gold and silver touches, as well as soft beige and gray tones. We saw a pop of eclectic blue as well used for a turtleneck ensemble that came matched with a mini skirt worn over black leather leggings and matched with an elongated vest in white. 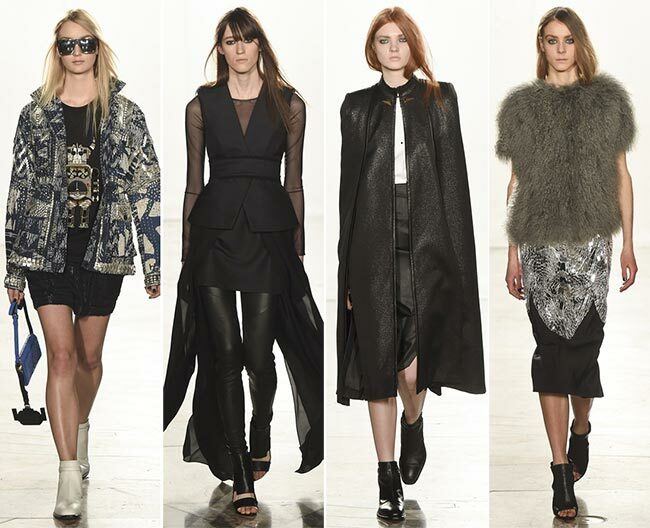 It was an urban contemporary look, a style we have seen a lot throughout the show. To make the gladiatrix theme pop instantly, Cuthbertson went for lots of creative samurai-inspired details, including edgy cut-outs and patterns, obi belts, solid blacks, leather and kimono-inspired shapes. He used metallic gold and silver threads for embroidery for the chic armor illustrations on the majority of the designs. We also loved the interesting game of sheer fabrics that were combined with leather and solid shapes to create a contrasting texture that dazzled. Of the fall 2015 fashion trends, we saw touches of Mongolian fur used for a gray shaggy short-sleeve sweater worn with a glamorous below-the-knee length straight skirt fusing solid black fabric with big proportions of eye-popping metallic silver. It also served as the main material for the cream urban coat worn with a pair of black pants and the black top with jewel embellishments on the front. The outerwear was ultimately powerful and diverse, featuring both little fur coats and oversized vests, but also classic blazers, knitted and tweed jackets and coats. Knitwear and tweed were also used for the clothing pieces, bringing mini skirts and easy-to-wear dresses that looked both chic and cozy. 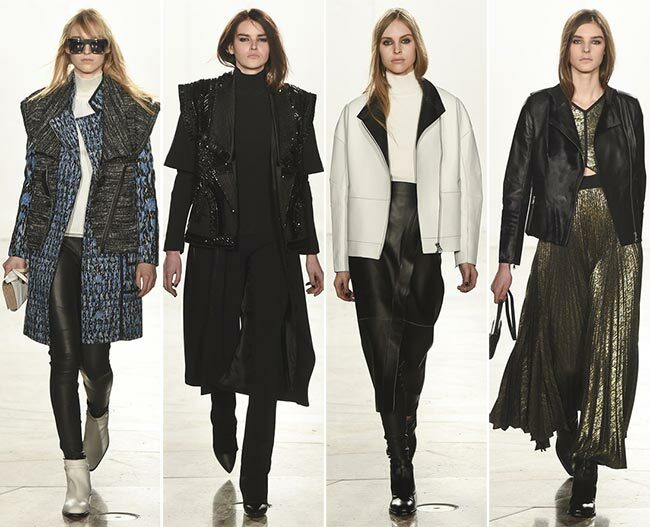 Generally, most of the lengths were kept short to place the focus on the bare legs or the second-skin black leather leggings that added to the dark and edgy feel of the entire Sass & Bide fall/winter 2015-2016 collection, looking especially dazzling in combination with the sequined tunics and dresses with mosaic-style embroidery. The looks presented were finished off with open-toe ankle boots, oversized sunglasses, fringed handbags and knitted beanies for the ultimate winter-ready feel. The makeup placed the stress on the dramatic smokey eyes that looked so eye-catching on the background of the powdered pale skin. The hair was kept straight spiced up with a subtle grungy feel. Overall, it was a strong collection that made party looks quite appropriate for daytime dressing as well!